A Piece Of Cake: Preesenting.. The Geek Element! You'd never have guessed. 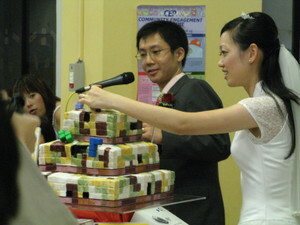 It's a Tetris wedding cake! How weird is that??? But it's so unique and fun and it was a real surprise for everyone who came to the wedding. And for people who knew the couple, they'd know straight away the "inside joke", you know? Because the groom is a real computer gadget person and actually, and he was the one who said his cake must have a geek element to it, and he thought of including Tetris since he likes the game. So I got to work thinking about the game and decided it'll be interesting to have rectangular shaped holes carved into the sides of the cake for the spaces that weren't filled. Thanks to Carol's nifty Sculpey handiwork, we had ornaments in the shape and colour of actual teris block configurations that looked like they were falling into position. The cake was displayed with all the groom's gadget boxes (mostly empty). The eager geeks among the guests hoped they were actually door gifts. duh. But the Topper was the really fun part! We had this idea of making a tetris blocks topper that made up the couple's initials, J and C. It was a T, L, L and the inverted L that made up the topper. Carol was super. She thought of using magnets to make the pieces attachable and detachable! When the cake was on display, it looked like the J and the C but after cutting the cake, the couple took apart the topper into their four individual blocks and fitted them onto the spaces of the cake I had planned for them.. And so the line was completed and the cake was to "disappear" (as in served up immediately)! The couple were very "game" (pun intended), and the part when they were looking around the cake to fit the topper pieces into their cake was very animated and interesting for everyone to watch. The groom then proclaimed that this cake will go down in history because it's has to be cut side ways because the line will disappear. Triple Latest... and a video montage on youtube!!! Thanks Jaleeb... It is totally geek with the flashing tetris borders and all that... People love your video. My picture's going to be all over the net!! It was a brilliant cake, I just wished there was a video that showed the cake in all its angles, the photos just don't seem to do it justice. 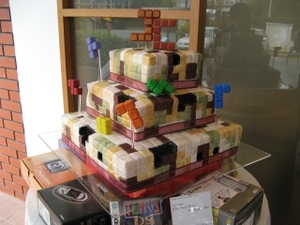 Hey, thanks again for the cake, it was one of the best games of tetris I ever played--so delicious that everything disappeared! Maybe someone did take a video? We'll look for it. I suspect ZY did. Hey, jm... thanks for the compliments. Groan... I hope this won't be the start of my career making computer game themed cakes... double groan... :OP Just kidding. As for the taste of it.. I guess you'll just have to take RexRetry's word for it? "Oh and for the record, it was delicious carrot cake with thick sugar frosting, which left the lot of us with a sugar rush. Just the way we like it." I made a montage of your cake using your images, I hope you don't mind. If you have any objections, I will remove it immediately. Congratulations on a masterpiece wrapped in fondant. I looooovvvveeee the cake! Your imagination is putting Da Vinci to shame! Sure, we can think about a camera cake but have to warn you... you need to put LOADS of black food colouring to make it a black camera. Blech.. There's a new, slightly different less abrasive version of the earlier montage on YouTube at http://www.youtube.com/watch?v=TF6PYQBXVlI that uses the original Gameboy soundtrack for the ultimate in Tetris Cake enjoyment! wow impressive can i shameless put a shout out on me facebook?